Currently Accepting Applications – These Two Eyes! I would just like to clarify one thing; I’m not on vacation. I’m unsure who I’m clarifying this for exactly, but I feel obliged to do so. Here’s the root of the problem, I want to be on vacation so badly, and I’m not, and therefore need to specify that to my readership. I guess you could say I’m now accepting applications if your interested in taking one. One may think, but you live in Australia, it must be paradise! Is this not a semi-permanent vacation for you? And this is what I’ll tell you dear reader…I do live in Australia AND there are many a paradises. However, I personally would not classify Brisbane as a paradise. I’ll let you in a secret though; paradise is less than an hour’s drive in the directions of North and South. Hehehe (insert evil laugh to make you a tad bit jealous). Did it work? So let’s get back to the problem, despite quote paradise unquote being a mere skip away there are still a few issues. Firstly, the heat has just sort of arrived so the weather is not quite perfectly ripe. I can’t complain about it just yet. Not till the sweat starts dripping down my face while I step on the bus, fresh from my recent shower, and step off the bus wishing the person in front of me had showered. What I’m trying to get at is that summer isn’t quite here yet. It’s still technically spring. When it is summer I will damn sure know its summer because the heat will be unbearable and I’ll think, ahhh summer! Let your rays shine on me! I think that is also when I’ll start “feeling” like I live in Australia as opposed to just randomly really really far away from everyone and everything I know. Maybe that’s also when I stop taking notice of the differences. Queensland is known for its sunshine and beautiful weather. The fact that winter was 60/70s, maybe 50s at night, means that I cannot even predict what true heat will feel like. I guess they compare the climate to southern Florida. Okay, secondly I don’t have a car or drive for that matter. I know, right! Like after 5 years of not driving you’d want me to attempt to gracefully manage the other side of the road without endangering people. So this puts me in a position of relying on other people going to paradise in order for me to go there. And add the fact that they have to actually want my company and invite me along. 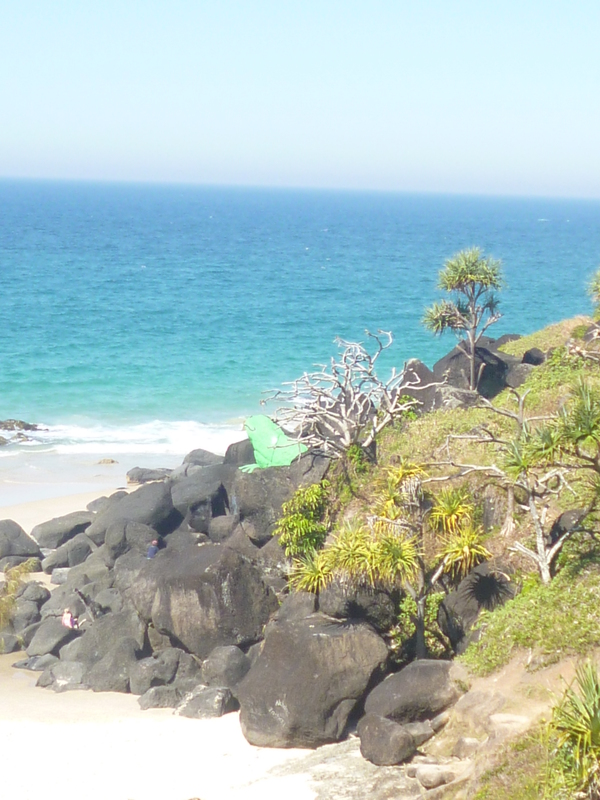 Luckily last weekend my friend Louise was kind enough to take me to a paradise otherwise known as Coolangatta Beach. Just an hour and half south of Brisbane on the Gold Coast, we hit the open road, skipped all the touristy spots and for my first time since moving to Queensland was exposed to crystal clear blue waters to explore the surfers, the bogans (remember them?) and the seafood. I lightly dipped my ankles in the chilly saltwater, tempting those sharks I know lurk in the murky depths, and then continued on with the strenuous task of acquiring a base tan. After a full day we came back to Brissy to mingle with another class all together – the Irish for the Rugby World Cup. I was just happy to jam out to a cover band, belting the Killers at the top of my lungs and pretending it was Mr. Greengenes! Since returning from Melbourne I’ve spent the last few weekends immersed in the Brisbane music terrain. 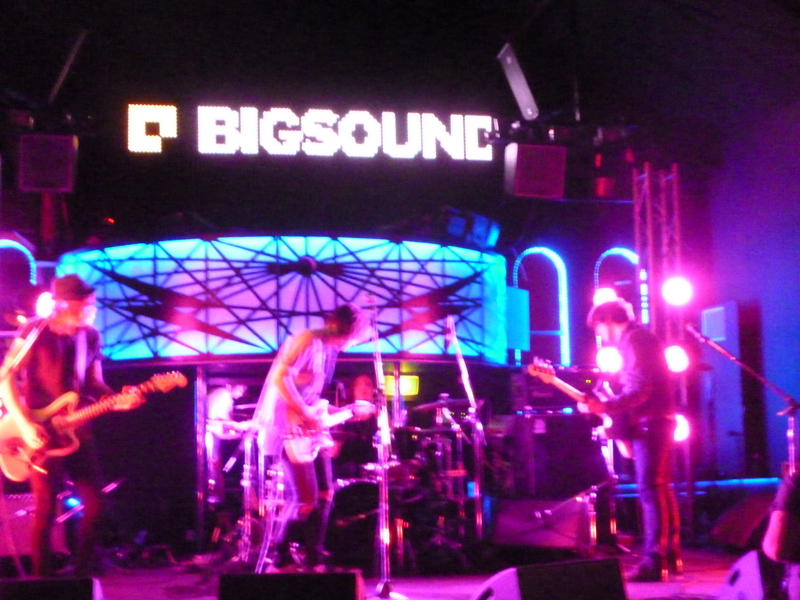 Big Sound was on a few weeks back. More or less a big industry event where music publishers, promoters, label execs etc all meet in the Valley while local and national up and coming acts play at pop up venues tucked in alleyways or at local dive bars. Pretty fun couple of nights in a music frenzy. I came across Spike again the other day. 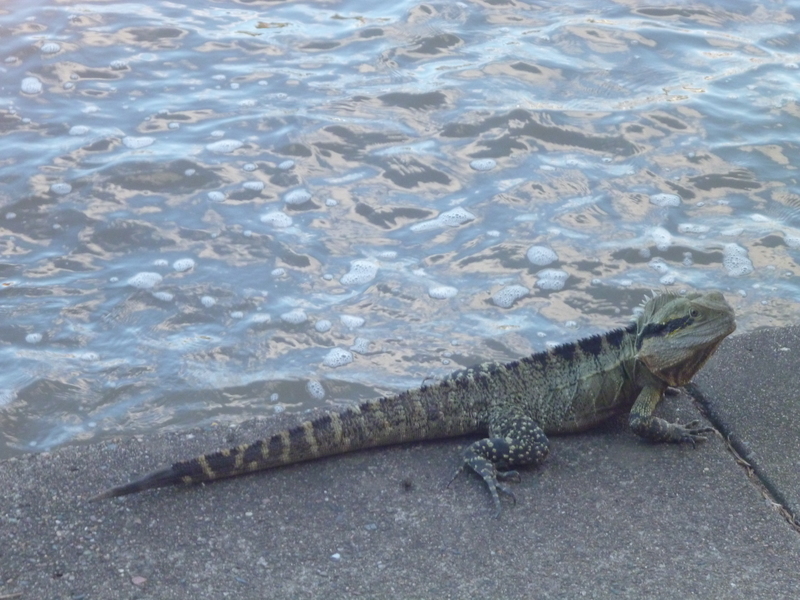 Spike’s the name given to the damn iguana that lives on the water next to the botanical gardens in the city. Typically this is what happens…I run along, struggle for breath here and there, and contemplate when to take my next break while trying to self-motivate then boom, ahhhh! Damn Spike is just chilling blocking my running path. And I go, “ahhhh, Spike!” He gets me every time. I then just stare at him for a while. I’m secretly a little nervous he’ll bite me or hop on and not let go. Some people say there are really big ones that just hang out in trees, like dinosaurs. Brisbane Festival is happening at the moment. It’s like 3 weeks or something of art, music, theatre, culture, blah blah blah. They kick it off each year with River Fire – basically a combination of fireworks and laser shows over the river throughout the whole city. 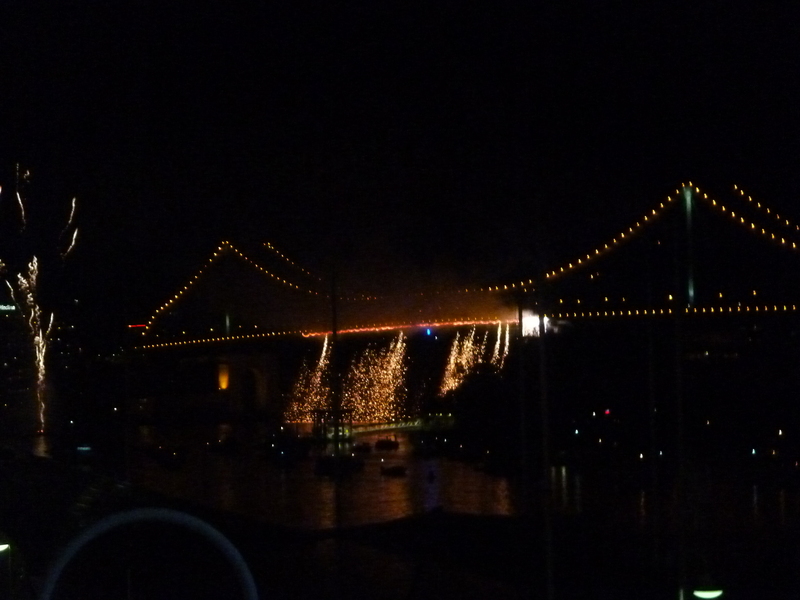 We booked a table on the water at the Bavarian Bier Café on Eagle Street Pier and watched the fireworks light up the Story Bridge. It was pretty neat, and apparently the view from Southbank is even better because you see the whole city light up. I was a bit indifferent however, perhaps due to seeing the 4th of July light up the sky every year on the beach. Tough life. Yes, the beach, back to vacation. So I’ve got my heart set on Bali or Vanuatu but it’s not looking so good. My options of travel partners are slim. Then I was going to pop over to Thailand to visit a friend from college and do some Koh hopping but flights are outrageous. I may just have to head back over to New Zealand for a long weekend or something while I wait for the beaches to warm up on the coast. I’ve got Byron Bay and a trip back to Coolangatta up my sleeve at least! Note to readers: This is no way was intentioned to sound like a selfish complaint. I hear fall is pretty chilly up on the Northeast coast of the USA however I did have to witness your summer from a far and it was torture. The accounts mentioned above were just literally the most interesting things that happened to me since I last wrote, a terrible internal turmoil of wanting desperately to travel and not doing much about it. Well, darn it, fine I’ll book something ASAP so I have something more inspiring to share! Thanks for clarifying! It’s all new to me but I’ll make an update.